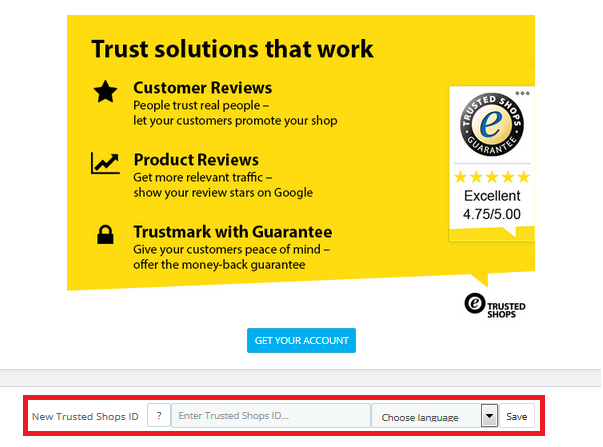 Effortlessly collect, show and manage customer reviews with the one and only Trustbadge® technology for your PrestaShop store! Once integrated, it updates automatically. Additionally you can integrate your trustmark and provide the money-back guarantee. Please note: our current module requires at least a version of PHP 5.5. If you use an older version, which you cannot update, you can download an older version of our module here. Please open your PrestaShop backend and go to modules>>Advertising and Marketing >> Trusted Shops Reviews Toolkit and click on install. Please note: If you have already integrated the Trustbadge® manually, please delete it before continuing. If you are using an old module please deactivate it before continuing. Enter your Trusted Shops ID (starting with X...) and choose the corresponding language. You can find your Trusted Shops ID, for example, in your My Trusted Shops Account or in your Welcome-mail. You will be forwarded to the configuration page automatically. You may change the variant of your Trustbadge (choose whether it shall be displayed with or without review stars) or adjust the y-axis position of your Trustbadge (Y-Offset). Finally, save your changes, and if necessary, refresh your PrestaShop cache. Congratulations! You have successfully integrated the Trustbadge®. The good news is that your Trustbadge® is already requesting reviews automatically. To invite previous clients to leave a review, start using the Review Collector and continue reading to learn how to export needed data within PrestaShop! 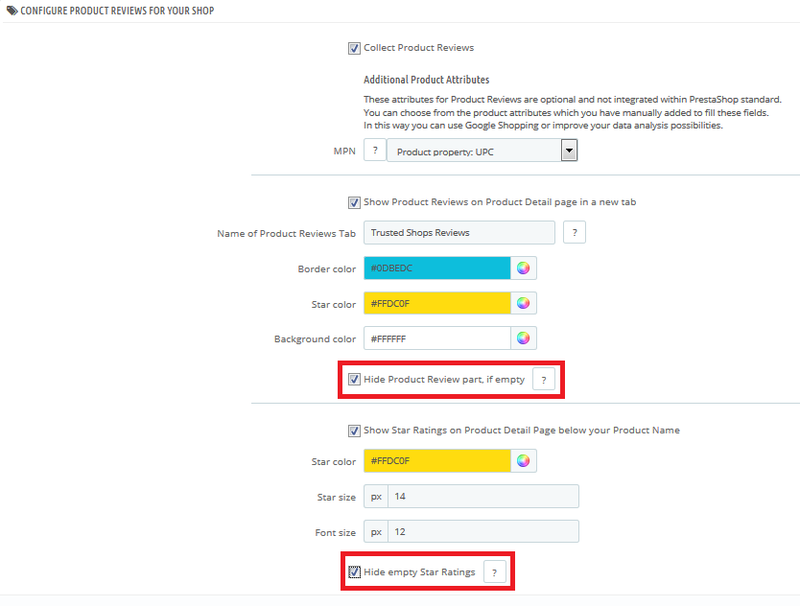 You can adjust the design of product reviews according to the needs of your shop by using additional parameters, e.g. you can set the border colour of the frame around your reviews or the colour and size of your stars. You may also set an individual headline for your Trusted Shops Product Reviews. 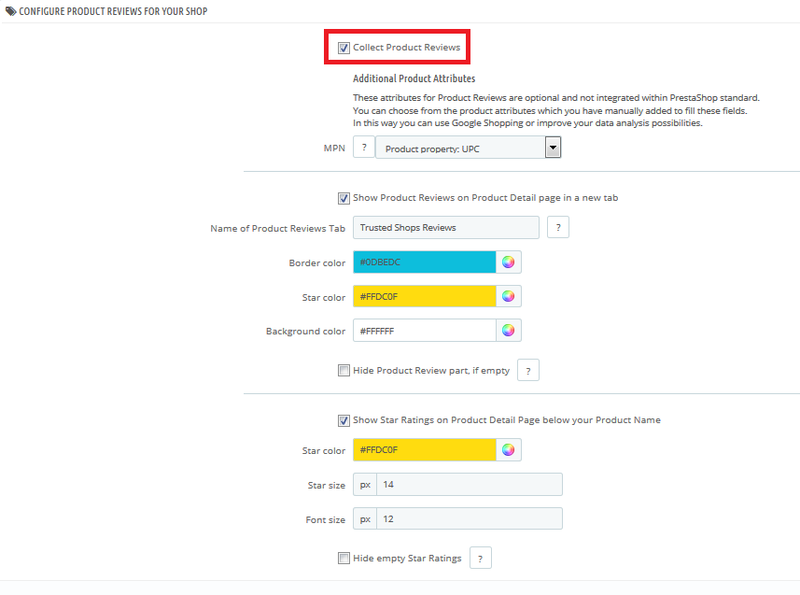 If you like to show your product reviews on Google shopping, you can choose which product attribute shall be used for the parameter MPN. All other needed parameters as GTIN (EAN) or brand are filled by standard fields of PrestaShop. Please note: Please make sure that your product data contains the GTIN (EAN), brand and MPN if you like to show your product reviews on Google Shopping. Replace the parameter YYYY-MM-DD with a date, which is no more than 2 – 3 months ago (i.e. 2015-01-15). Save your changes. In the SQL Manager, you now have the possibility to View the result or to Export it right away. After clicking Export you need to save the file on your computer. Open the file with spreadsheet software, for example MS Excel. Delete the first line containing the titles and save the file as a .xsl or .xslx file (excel format).